Giving new meaning to the phrase “close but no cigar,” word is when Twentieth Century Fox boss Darryl F. Zanuck reached the end of Sergio Corbucci's darkly subversive 1968 Spaghetti Western The Great Silence, he was rendered so speechless by the film's bleak ending that he swallowed the cigar he'd been smoking in absolute shock. Unwilling to distribute the stark, anti-authoritarian picture in the United States (even after Corbucci was asked to shoot two new thankfully unused conclusions), Zanuck relegated Silence to a foreign release. And Corbucci's film did fairly well everywhere but its native Italy where – like Zanuck – one Sicilian viewer was so upset by the final showdown that he fired his gun in anger directly at the movie screen. 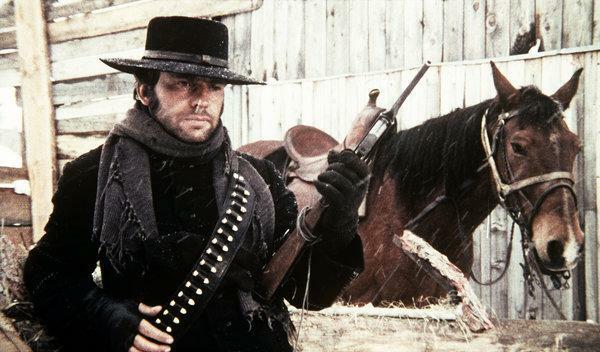 A revisionist take on the genre's classic Shane style paradigm wherein good triumphs over evil once a polite cowboy rides into town and sets things right, in Silence, A Man and a Woman actor Jean-Louis Trintignant saddles up for duty as the film's mute gunfighter-for-hire title lead. Newly arrived in Snow Hill, Utah, Trintignant's Silence finds himself quickly caught up in a two-sided conflict. Turning the convention of "bad" outlaws and "good" bounty hunters on its head, in The Great Silence, the turf war is between a group of outlaws – many of whom committed petty crimes in order to give their loved ones something to eat – and the "bounty killers" who make a living getting away with murder plus a reward by gaming the system of killing in the name of (forced) self defense. The brutality of the film's bounty killers led by Klaus Kinski's sadistic Loco (whose character was partly inspired by Boris Karloff's vampire in Mario Bava's Black Sabbath), as well as its message of political and judicial corruption are apparent right from the start of what Repo Man filmmaker and knowledgeable genre scholar Alex Cox has dubbed "the most pessimistic western of all time." Reflecting the off-screen violence of 1968 – and the deaths of Che Guevara and Malcolm X in particular – by subverting the genre that he treasured but had recently felt growing stale as a storyteller, Corbucci set out to make his own snowy homage to John Ford's Cheyenne Autumn and Andre DeToth's Day of the Outlaw. 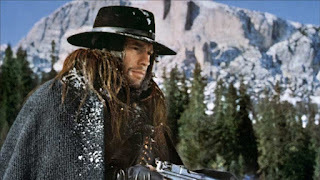 Filmed in the Italian Dolomites as opposed to the traditional Spaghetti locale of Spain, Corbucci's opus opens with a sea of white as far as the eye can see. Augmented by twenty-six tons of shaving cream, the snowy visual scope not only matches Silence's melancholic tone but, contrasted by its dark sets and costumes, it punctuates the film's bursts of red blood and black gunfire that much more. 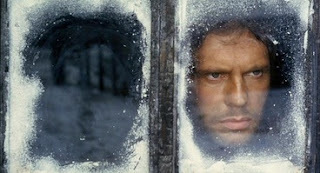 And similar to the way that a memorable match cut of a flame is employed to take us from the present to a flashback – from Ennio Morricone's simpler and relatively downbeat score to the brutal (and occasionally blurry) beauty of Silvano Ippoliti's cinematography – everything in Silence foreshadows the eventual literal and metaphorical darkness to come. Worthy of endless analysis from political to religious to Freudian to moral, the revolutionary work makes brilliant use of a genre that lends itself so well to subtext. Breaking new ground, although relatively chaste, Silence notably features Corbucci's one and only love scene. Serving as a powerful step in the right direction in terms of gender and racial equality, not only is the romantic moment initiated by its female lead (after she's given a firm no to someone else) but by featuring a white actor and black actress in the form of Trintignant and talented newcomer Vonetta McGee it's also interracial in nature. 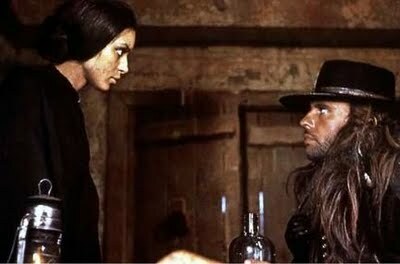 And although Corbucci had no interest in filming another, by using love instead of war, Silence's brief moment of tenderness might've broken down walls that violence wouldn't breach in movies to come. 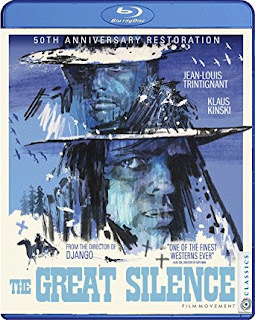 For decades only a cult film here in the United States, now thanks to Film Movement, The Great Silence has at last been given a gorgeous 2k restoration and theatrical release in time for its fiftieth anniversary. As loaded with bonus features as Corbucci's film is with symbolism, the brand new Blu-ray and DVD editions of Silence boast a terrific essay from film critic Simon Abrams, the two unused alternate endings, a commentary featurette with Alex Cox, as well as the 1988 Spaghetti Western documentary Westerns, Italian Style and more, although the main draw remains the film itself. Visually reminiscent of Robert Altman's own subversive 1971 western, McCabe & Mrs. Miller, The Great Silence also served as a major influence on Quentin Tarantino's work. Yet despite the fact that Corbucci paid homage to multiple films in just as many genres, in terms of how to make a Spaghetti Western set in the late 1800s relevant to those in the late 1960s, in the end, Corbucci was far more inspired by events playing out in the news than he was by art. 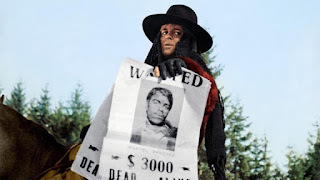 A fascinating watch, now with the Trump Administration working to game the system, escape justice, and dial us back to Old West era laws, eerily some of the political arguments and warnings in Corbucci's classic have become timelier than ever. Just like the flame in the film that flicks us from present to past, The Great Silence shows us that although things have changed, when it comes to where we ultimately want to be as a country, we're still close but no cigar. Yet even though it holds up a startling mirror to society, maybe instead of feeling defeated by the ending, we can just worry about right now and keep fighting for what's right.